Whether your idea of a holiday is adventure or relaxing Alluvion is the perfect base for you. On the beach where the river meets the sea Alluvion is what you would expect in a beach house. Ideally located adjacent to Swan River it has direct & level access to a safe beach. Take our sit on top kayaks ( available for hire) or go beachcombing along the foreshore and marvel at the thousands of tiny red crabs that scurry around at low tide. There's an ideal fishing spot at the nearby jetty to make use of complimentary fishing gear that is provided. Or try a game of golf at the nearby golf course (500m away - 9 holes pay & play). We provide two complimentary golf sets if you didn't have room in the car for yours! Or simply sit and relax, a nice Tasmanian red or white in hand, and enjoy the bird life at property ranging from a variety of honeyeaters to seabirds diving for fish. All this from the rear deck. Alluvion is located approximately 6 km from the township of Coles Bay where you can find a range of restaurants, cafes, local tavern and two general stores. A further 5km away is the iconic Freycinet National Park. Splendour at the world famous Hazards, which change colour depending on time of day and light conditions, or take a walk to the lookout to marvel at the iconic Wineglass Bay, a fantastic photo opportunity, and if you're feeling up to it walk down to the beach and marvel at the fine soft white sand and the beautiful pristine waters. The property sleeps up to seven people across two queen rooms and room with three single beds (one is portable). Fully furnished Alluvion has a very homely feel. The living areas are open plan and include a well equipped kitchen, spacious living & dining areas and even a play corner for the kids. The layout provids guests with the opportunity to relax and unwind whilst re-connecting with family and friends. Alluvion has a well equipped kitchen, modern television and dvd player, linen and towels, and with the deck, barbecue and wood heater, is a cottage for all seasons. This individual property, with plenty of off-street parking, gives scope to enjoy the local birdlife and the garden, which runs down to the beach. Fishing rods are available for fishing off the beach, and golf clubs are provided for use on the nearby nine-hole pay and play course. Discounts apply to off-peak weekly stays. Located in the heart of the Great Eastern Drive The Freycinet region includes Coles Bay and the magnificent Freycinet National Park, with its acclaimed bushwalks and activities including sea kayaking, rock climbing, ocean cruising and wildlife observation. Local oysters and cool-climate wines are east coast highlights. To the south, Maria Island National Park is a short ferry trip from the coastal town of Triabunna and to the north is the world renown Bay of Fires, located at the township of St Helens. Although not located on a "beach" as such the cottage is in a beautiful spot on the inlet which at high tide is just gorgeous to look over from the entire living area or whilst having a cuppa on the private back balcony. The place is so very peaceful and relaxing we wished we could have stayed longer. A home away from home with everything you need. Great view from deck, lovely beach walks. Great location and lovely view from deck. Our bed was very uncomfortable, a queen bed with a firmer mattress would have made our stay perfect. We visited Freycinet marine farm and the sea food was delicious. Comfortable and relaxing. Great location. This place reminds you of places you stayed on long summer holidays as a kid. It's a very relaxed atmosphere. There is a great deck looking out over the bay. Has everything you need including washing machine. Pet friendly as well with a secured backyard. This place is extremely well located in Coles Bay with a 5 minute trip into the little village. Great pizza and ice-cream as well as a little grocery shop. You can pick up a boat and take a trip across to Wineglass Bay which we did. Lovely strolls in the evening and mornings. 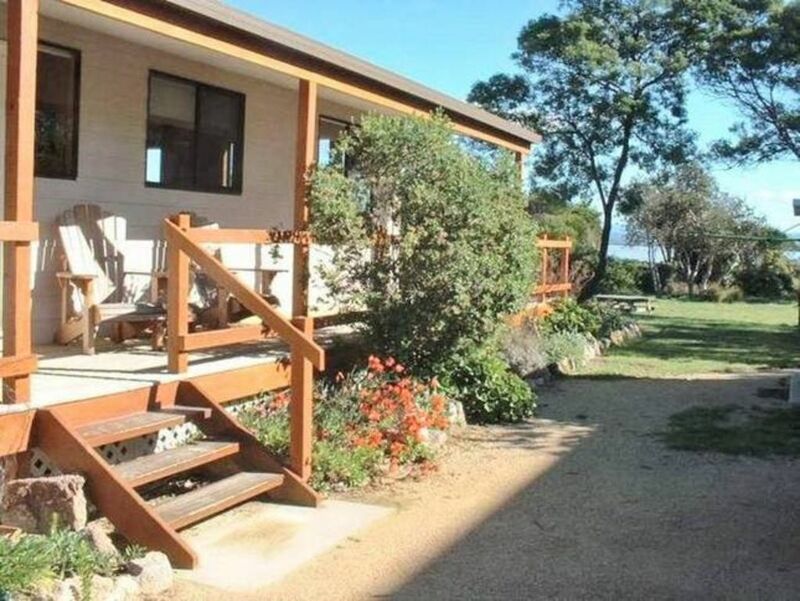 Alluvion Cottage is a perfect base for enjoying the best of the Freycinet. The cottage is comfortable, well appointed and welcoming. Great for couples as well as family groups. Highly recommended! Right on the water, and really peaceful.